It appears with each passing year, Grand Valley State University receives more and more well-deserved recognition for its health curriculum, its business program, its sustainability practices and many other accolades while just last year, GVSU's television program, West Side Stories, won first place in daily newscast at the Michigan Broadcasters Excellence Awards. 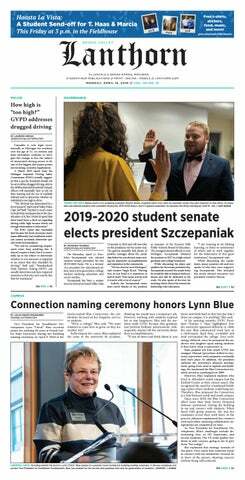 The Lanthorn is annually recognized as one of the top student-run newspapers in the state and The Whale Radio station has grown in popularity over recent years. Many of these accomplishments are met with further funding and construction to help these programs flourish, while student media continues to beg for scraps from the Student Life Fund. Recently, multimedia journalism professor Len O'Kelly spoke at a general assembly senate meeting to make his case on the issue. O'Kelly mentioned GVSU's current ranking of 14th out of 15 in the state for student media funding, with some higher ranked universities awarding 10 times the amount of GVSU's $85,000 media budget. These funding constraints currently hinder student media's effectiveness on GVSU's campus. The Whale, currently transmits on an internet-only signal, where an FM station could boost the stations reachability and most of all, credibility. Funding issues are also what led to the Lanthorn's decreased circulation which dropped from two weekly editions to one beginning last fall. O'Kelly and student media are in alignment that lack of funding will never be used as an excuse to diminish coverage, but it does put a strain on things. It is the goal of student media to give a voice to the university's community and keep the public informed, as are the long-standing values in journalism. While student media organizations are connected to the multimedia journalism program, they also employ and support students of all majors and experience levels that are looking to get their voice heard. Funding to student media comes directly from the Student Life Fund, which is allocated by the Student Senate finance committee. This can be a daunting task for the committee, who likely don't have full grasp on the needs of student media or its inner-workings. This falls on both student media officials and senators to come together to understand the needs of media combined with the budget constraints on senate. O'Kelly started this conversation at a recent senate meeting, but it is up to both parties to keep these discussions moving forward. The lack of funding to student media can feel discouraging but it hasn't dampened spirits to keep fighting for more. Student media has tried in the past to generate some funding through events like Lakerpalooza. More events and creative ideas are imperative to providing increased revenue to student media and to integrate the GVSU community into the fundraising process. Student funding through subscriptions has been discussed as a means to support student media, but it has yet to be implemented. It becomes discouraging over time to see yet another health building sprout up on the downtown campus while Lake Superior Hall, built in 1963, continues to house the School of Communications. Construction and program funding comes from the university, but they appear to be falling into line with Student Senate in keeping revenue stagnant. To be an effective medium for the GVSU community, student media has to have plentiful funding to keep up with the growing needs of the university.